Knowledge Base Home Create Email Marketing How do I create an RSS to Email campaign? How do I create an RSS to Email campaign? Sign in into your Benchmark account, once there click on Emails in the left menu. Click on Create new Email button. Select RSS email from the options provided. 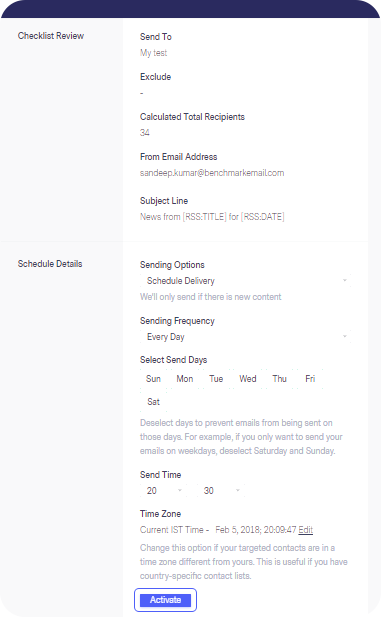 Select the Editor Type you will use to create your RSS Email Campaign. In Step 1 Details: Enter the URL for your RSS/XML Feed URL. Provide the basic details about your email and click on Save & Next to continue. If you don’t have this address handy, click here. Select the contact list(s) you want to send the RSS Email Campaign to. Click on Save & Next to continue. If you choose the Drag & Drop Editor, select a Template for your email. You can choose from our specially created RSS Email Templates (recommended) or you can pick any of our existing email templates. Click on Save & Next to continue. You can now customize your email with your messages. There are placeholders for the RSS Content which would be used to display content from your RSS Feeds. Click on “Preview / Test Email” to see a preview of the email. You can also send a test to get a copy of the email to your account. Click on Save & Next. Last, schedule the email to be sent either every day/week/ or month at the given time. If there is no new content which is available on the RSS Feed, no email would be sent. Search for the name of the email. Click on the three dots against the RSS email in concern and click on “Deactivate” in the drop-down. This would pause your RSS Email campaigns. You can restart it by clicking on the same three dots and select “Activate” listing and clicking on “Confirm” in the confirmation popup. 1. 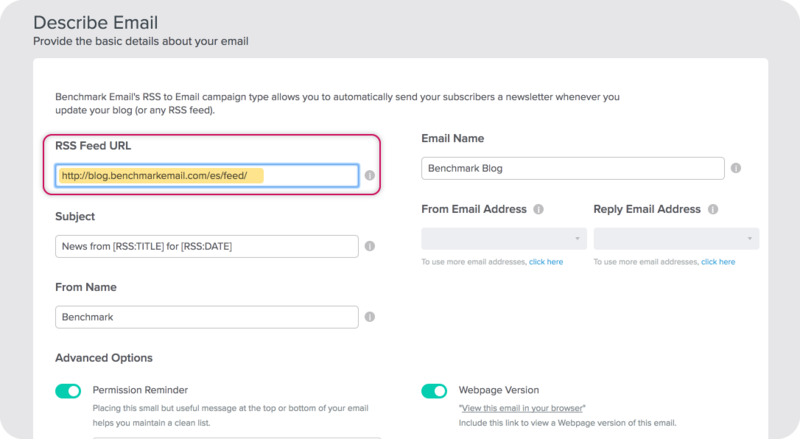 Sign in into your Benchmark account, once there click on Create Email in the upper menu or click the green drop-down button, then click on RSS Email Campaign. 2. 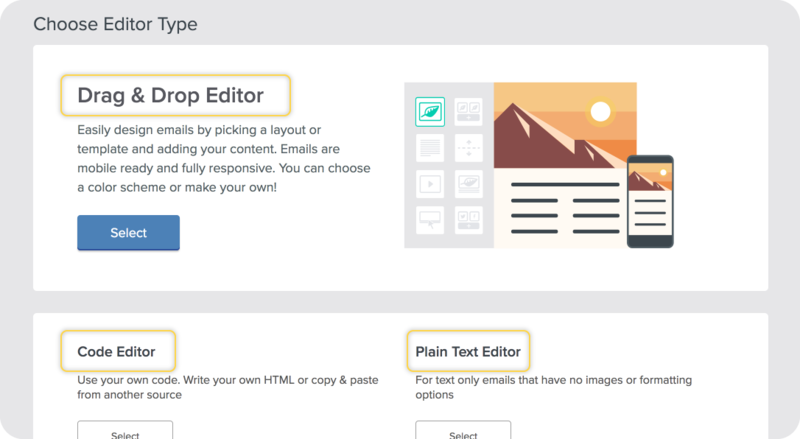 Choose the Editor Type you will use to create your RSS Email Campaign. 3. The Describe Email Screen is going to appear. Enter the URL for your RSS/XML Feed URL. Provide the basic details about your email and click on Save & Next to continue. If you don’t have this address handy, click here. 4. Select the contact list(s) you want to send the RSS Email Campaign to. Click on Save & Next to continue. 5. If you chose the Drag & Drop Editor select a Template for your email. You can select from our specially created RSS Email Templates (recommended) or you can pick any of our existing email templates. Click on Save & Next to continue. 6. You can now customize your email with your own messages. There are placeholders for the RSS Content which would be used to display content from your RSS Feeds. Click on “Preview / Test Email” to see a preview of the email. You can also send a test to get a copy of the email to your own account. Click on Save & Next. 7. Last schedule the email to be sent either every day / week / or month at the given time. If there is no new content which is available on the RSS Feed, no email would be sent. 1) Click on the Emails Tab 2) Search for the name of the email. Click on the Stop RSS Icon and click on “Yes” in the confirmation popup. This would pause your RSS Email campaigns. You can restart it by clicking on the Start RSS Icon from the listing and clicking on “Yes” in the confirmation popup. How can I resend a campaign to contacts from an existing list? Comment m’envoyer un email test afin de vérifier ma campagne? Y-a-t’il une limite à ce genre de test? There were some errors in my past email. Should I resend my campaign ?